If you read my 30 Before 30: Final Check-In earlier this week, you know that I only managed to accomplish about half of what I set out to do before my 30th birthday on April 26. I'm not giving up on a lot of those goals, though. 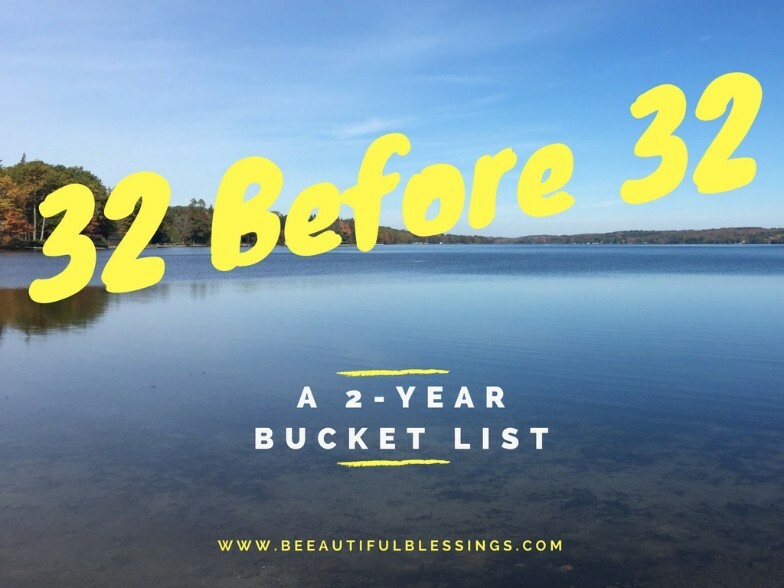 I've decided on my 32 goals before I turn 32, and I'm carrying a lot of those pre-30 goals right on over to my new bucket list! 1. Take an international trip | This was the very first item on my 30 Before 30 bucket list and one that I definitely hope to accomplish before my 32nd birthday. So where am I wanderlusting for? The number one on my travel to-do list is to visit the Christmas markets in Germany and Austria. I'd also really love to visit Ireland, Scotland, Sweden, Kenya, and South Africa (in no particular order). 2. Host a foreign exchange student | I've been bugging Chuck about this for ages. Our finances haven't been great, and our bedroom situation would need to change, but I'm hoping we can commit to this in the next two years. 3. Pay off a student loan | This is another one I'm carrying over from my 30 Before 30 list (sigh). 4. Return to work full-time | When I quit working full-time after Crosby was born, I didn't know how long it would last. I thought maybe we would just conquer his first year and finish breastfeeding, but then I started my part-time marketing job and I've grown to love it. Our current arrangement is kind of amazing for our family, so I'm not sure what the time-frame will be. I do know that I'm feeling more ready to go back than I was when Crosby was an infant, so I guess now I just have to wait and see where life takes me! 5. Visit a new state | Although I was born in California, I haven't been back since we moved away when I was four. I'd really love to visit Northern California so that's probably on the top of my state to-see list. This is also another goal that I didn't get to before my 30th birthday. 6. Convert attic to a fourth bedroom | This was number one on my house to-do list from the time we bought our home. (See a "before" of our attic/bedroom). However, it's going to be a more expensive project than we anticipated so it's gradually gotten pushed to the back-burner. There's asbestos in the attic that we need to get rid of before we even think about making it Charlie's bedroom. Then, we need to install a heating duct and window. Once those three things are complete, it's just a matter of painting, furnishing, and decorating. 7. Take an anniversary trip | Honestly, I don't even care where we go. I just really want an anniversary getaway with my hubby. I was hoping to have traveled last year for our 5th anniversary. However, I was still breastfeeding Crosby and we couldn't really afford a trip anyway, so we decided to postpone it. 8. Adopt a four-legged friend | For some strange (and slightly heartbreaking) reason, I've developed a dog allergy as I've gotten older. We always had a dog when I was a kid and I never had any issues, but I lost my resistance to animal dander, apparently. I miss having a dog around and both my boys are very skittish around big dogs, so I think it would really benefit them to have a pet of their own. I've done some research into hypoallergenic breeds, so we'll likely go with some kind of poodle or schnauzer. 9. Run a half marathon | The bad news is, I didn't check this one off before I turned 30. The good news is, I'm training as we speak and should be checking it off by the end of 2018! 10. Replace our back porch | Our back porch was kind of shoddily put together and we've had multiple stairs break in the time that we've lived here (less than three years). It's not the safest it could be for the boys and we'd like to be able to grill and hang out back there without worrying. 11. Visit Frankie's grave | I had hoped to check this off my 30 Before 30 list, but I never managed to make it to DC in the last few years. This is one that I'm determined to make happen, however long it takes. I miss Frankie so much and I really want to pay my respects. 12. Attend a cooking class | By now, I assume it's no secret that I love anything having to do with food. One of Chuck and my favorite things to do as a couple is to watching cooking shows and explore new restaurants. I think it would be so much fun to take a cooking class together for one of our monthly date nights. 13. Pay off all credit cards | This is another financial goal that I wished we could have done before I turned 30. But with some discipline, this is totally within reach to do by 32! 14. Renovate our kitchen | If I'm being honest, I don't think this will likely happen in the next two years. It's more of a cosmetic project versus our other projects that are needed for the safety and functionality of our home. That being said, I'm including it on my list because I don't really like our kitchen in its current state. It's galley-style which I'm not a fan of and the dark, olive green walls make it feel even smaller than it is. I'd really like to paint the walls a lighter color, paint or stain our cabinets, install new counter-tops, add a tile back-splash, and install a farmhouse sink. We actually already have the sink, but the other things will definitely take up some time and money. 15. Get a fourth tattoo | I got my third tattoo before I turned 30, so now I need to get a fourth before my 32nd birthday. I've known what I want for ages, I just haven't been able to justify the expense with two little mouths to feed. 16. Take a family camping trip | I think the boys would have so much camping! We've already got all the camping supplies we would need, handed down from my Mom. And we actually have a really nice lake and campground just a few miles from our house. So this one is totally doable for Charlie and Crosby's first family camping trip! 17. Update my wardrobe | I haven't purchased much of anything clothing-wise since having babies. My body and style have changed so much since then and I could really use some more professional dresses, slacks, and blouses. I don't know exactly how to quantify this one for blogging purposes, so let's say that I'll be content when I have three weeks' worth of nice, business-appropriate outfits. 18. Add a railing to our front porch | This is another project that has needed to happen since we bought our home back in 2015. We have no railing around our porch and it's about a 2-foot drop so we basically never have the boys in the front of our house. I want this for safety, as well as for aesthetic reasons because the front of our house just looks awkward without it. 19. Try 10 new restaurants | This is another goal that I think would be fun to tackle with my lifetime date. 20. Enroll Charlie in pre-school | This will probably be the easiest goal to attain because it's happening this Fall, whether I like it or not. It feels surreal that my first baby will be old enough to be in pre-school, but as someone who's always been an academic, I'm really excited for the school age to start! 21. Landscape our front yard | The yard in front of our house is kind of torn up and crappy-looking after we had to address some basement flooding awhile back. Realistic goal: Plant some flowers or shrubbery. Lofty goal: Have some planter boxes built. I'd also like to power-wash the front of our house. It feels silly to make that its own goal, so I'm including it here. 22. Meet a blogging friend | I've developed some amazing relationships with a few bloggers I've followed over the years and I would love the opportunity to meet them in person. 23. Plan something for Chuck's 30th birthday | The secret's out- I'm a cougar. I'm about a year older than Chuck, so I want to plan an event or activity that he would love. Whether it's a surprise party or a dude's disc golfing weekend, I want to plan something super fun to thank him for being such a wonderful husband and Daddy. (He will likely read this, but I'm 99% confident he'll completely forget before his birthday next year). 24. Purchase a minivan | I want a minivan so badly. My little Kia Forte has been so good to me, but I can't wait to finally pay it off. And I especially cannot wait to not have to cram two ginormous car seats into such a tiny car. 25. Take a photography class | I have my long-awaited DSLR, now I need to have to figure out how to use it. I've been playing with it for about three months now, and I still have no idea what I'm doing. 26. Pay off all medical bills from Crosby's birth | Due to a really stupid mistake (that I'm still kicking myself for) that I made with my insurance after Crosby was born, we wound up owing much more in medical expenses than we had anticipated. We have three bills left that shouldn't take too much longer to pay off. I can't wait to have that burden lifted! 27. Run a race in 3 different states | I've already mentioned my desire to run a half marathon this year. I also want to go a step further and make it a goal to run a race in three different states. Whether it's a half marathon or a 10k, I think this would be really fun to do over time. 28. Visit the American Sign Museum | This is a museum in Cincinnati that I've wanted to visit for awhile now and just haven't made it a priority. 29. Paint and finish decorating our master bedroom | I already have a lot of the prints and decor I want to hang, now it's just a matter of painting. 30. Take the boys to an amusement park | Whether it's Sesame Place this summer when we're in PA, or just a hop, skip, and jump over to Planet Snoopy at King's Island, I want to take my little dudes on some rides! 31. Visit Old Man's Cave in Hocking Hills | I've had this on my bucket list ever since moving to Ohio. 32. Attend a concert | It can not be overstated how much Chuck and I love live music. Concert-going hasn't been on the top of our priority list these last few years, but I'd really like to change that. So there you have it, my bucket list for the next two years. I'll be checking in on my progress every six months, so stay tuned!